This JOC project is for a broad range of maintenance, repair, rehabilitation, and new construction within public right of way in various locations around the City of Peoria. The scope of work includes work tasks or job orders as requested to complete wet utility pipeline construction projects including water, wastewater, reclaimed water, and storm drainage. Achen-Gardner Construction has completed several job orders that required the rehabilitation of sanitary sewer pipes using cured-in-place pipe (CIPP). We have also completed one job order that included the rehabilitation of a 16" water line with Primus Line (see details below). In addition to working with the City of Peoria, several other public agencies have utilized this JOC contract to hire Achen-Gardner Construction to perform similar wet utility work. If you are interested in cooperative purchasing (or piggybacking) please contact us. In May 2018, Achen-Gardner Construction achieved another first in the field of pipeline rehabilitation in Arizona when our crews rehabilitated a 1,300 LF section of 16" PVC water line with Primus Line. Primus Line is an innovative pipeline rehabilitation product consisting of a multi-layered, high strength, and flexible material that is pulled into the host pipe and then terminated to connect with standard pipe flanges at each end. The material is both AWWA and NSF61 approved for potable waterline applications and is rated to operating pressures in excess of 450 PSI. The trenchless pipe replacement was completed for the City of Peoria as part of our Wet Utility Pipeline Projects JOC. The location of the project was at Thunderbird Road and the ADOT Loop 101 Freeway. 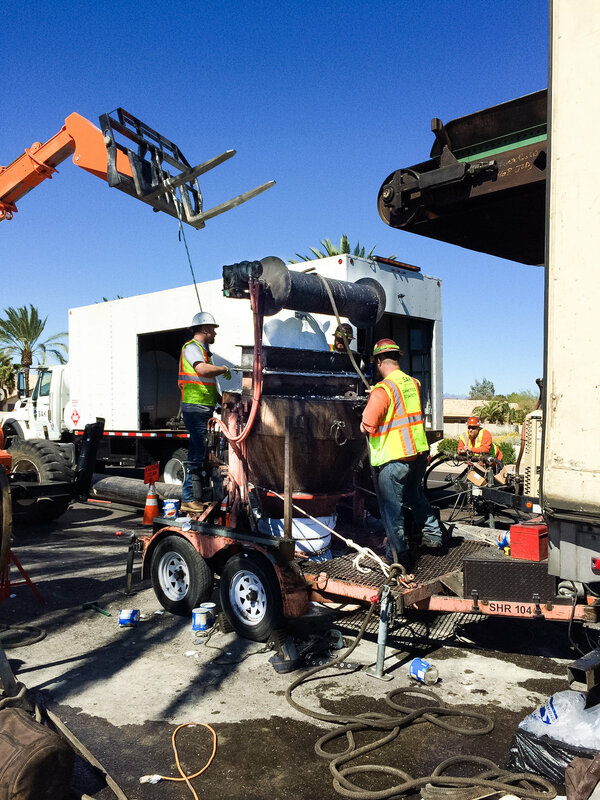 Since ADOT would not allow an open cut water line replacement under the Loop 101 Freeway, trenchless construction was determined to be the best approach and Primus Line was selected to be the best product. This approach accommodated ADOT’s requirements, alleviated issues with installing pipe around heavy traffic on Thunderbird Road, and shortened the overall project duration. This was the largest diameter and longest section of Primus Line ever installed in Arizona, and as the general contractor, Achen-Gardner Construction self-performed all of the work. Two access pits, each approximately 8' by 12', were the only excavations required and the total time to pull 1,300 LF of Primus Line through the host pipe was 16 minutes. Installation of the 1,300 LF liner took a total of two weeks - from digging the first access pit to final testing, paving, adjustments, and striping. Connections to the existing water line, pressure testing, and disinfection were performed in five days. A total of seven workers made up the crew that completed this work quickly, safely, and with the highest level of quality. 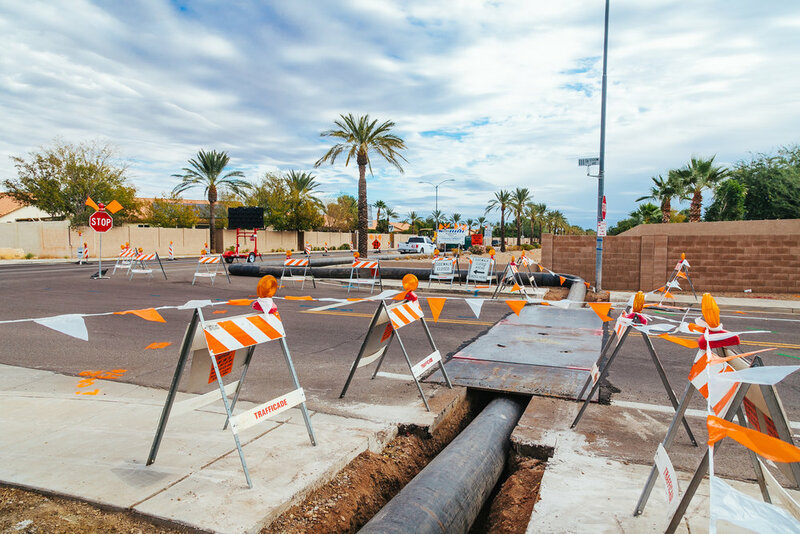 Achen-Gardner Construction continues to lead the Arizona industry in pipeline installation as well as innovations in trenchless replacement and rehabilitation options. We appreciate this unique opportunity and acknowledge the valuable contributions from our team members: City of Peoria (Owner), CVL Consultants (Design Engineer), and Construction Product Marketing (Material Supplier and Technical Assistance).